This unique wine rack adds form and color to any space. It is both attractive and functional. The unit can be placed in one of two orientations; the basic puzzle (a) or the symmetric (b). While a single unit stores nine bottles, multiple units are easily assembled to create different rack sizes accommodating the needs of a modest user to a large user, such as a restaurant. The rack is injection-molded from transparent ABS recyclable polymer in a range of colors. 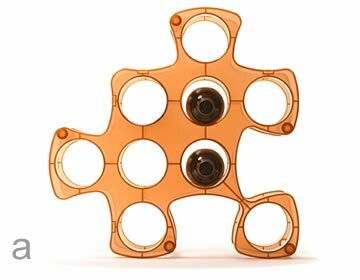 Size: 18.5"w x 18.5"h x 8.5"
The Puzzle wine rack was selected and exhibited in the California Design Biennial 2005 representing the most innovative and creative design in California.